13. 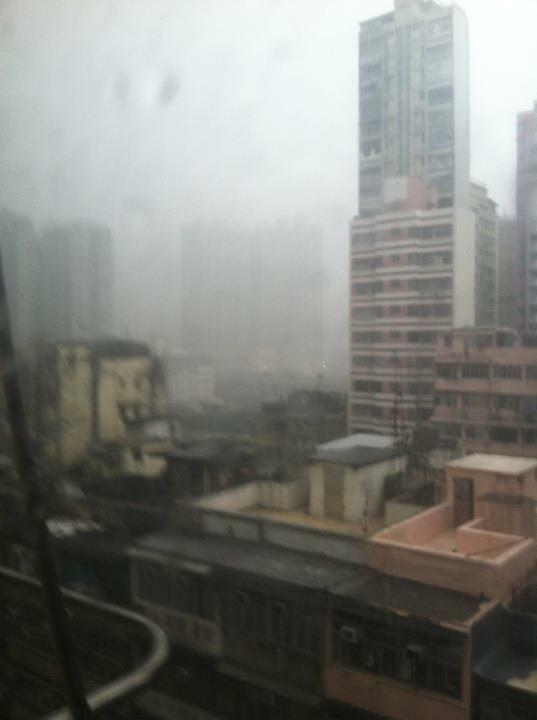 Spring is the worst season in HK. I love spring, the snow melts, flowers bloom on the trees…in fact, spring in Washington DC is the best time of year. However, spring here is miserable. The sun came on on Friday for the first day in weeks. It’s been raining and cloudy since I returned from Thailand. The weather forecast frequently calls for “squally thunderstorms”…whatever that means. The city uses a rainstorm warning system to alert the public to flooding and high rainfall. The levels are Amber, Red and Black. We’ve had two Amber rainstorms already. Finally, in addition to the rainfall, the humidity level stays above 75%, so it’s always wet outside. The fourth tallest building in the world is missing from this photo because it’s been engulfed in cloud cover! The weather cleared up on Friday, but the rain should return on Wednesday and apparently won’t really go away until June. April 15, 2013 in Fun Facts.